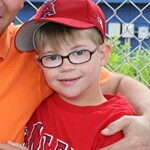 John Bremer was 2 1/2 years old in June of 2005 when he was diagnosed with acute lymphoblastic leukemia (ALL). John also has Down syndrome. Kids with Down syndrome are 10 to 20 times more likely to get leukemia than typical kids. John endured three years and two months of chemotherapy completing treatment in August of 2008. Despite being weak, bald and bloated, John continued being a kid, playing and laughing whenever he felt well enough to do so. Today he is a happy, healthy little boy with a full head of hair!